A FULLY-integrated technology platform designed to meet the needs of upstream bioprocessing laboratories has been launched by Sartorius Stedim Biotech. The Connect Upstream platform combines a high-performance expression system with equipment and process control systems, together promising to accelerate the development and scale-up of high-titer commercial manufacturing processes. Sartorius notes that the biopharma sector faces challenges to deliver safe and effective products to an increasingly competitive market. Companies must assess and focus investment on drug candidates with the greatest chance of success. This means drastically cutting early-stage development timelines and reducing the time before products reach the medical profession. The upstream technology platform combines a range of products and services from Sartorius Stedim Biotech and, says the company, addresses this challenge without compromising on quality, productivity or robustness. Sartorius claims that biopharmaceutical manufacturers will be able to reach the clinic in just 14 months by leveraging this new platform. The royalty-free CHO expression platform of SSB’s subsidiary Cellca delivers the titers, and can establish a research cell bank for clients in just four months. 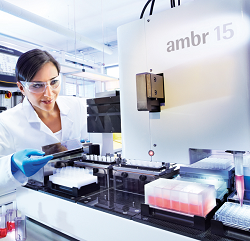 The automated Ambr15 micro bioreactor system is capable of controlling 24 or 48 micro bioreactor experiments. The system accelerates clone selection and readily scales up to Biostat STR single-use bioreactors, which are suitable for pilot and GMP production scales. SSB has integrated more than 100 off-the-shelf and pre-qualified assays from BioOutsource, facilitating the rapid testing and analysis of biosimilar products. “We are introducing a whole new level of efficiency in upstream processing,” said Stefan Schlack, senior VP marketing and product management for bioprocess at Sartorius Stedim Biotech.